Sidhil News: Robert Gregory...making it better! We have an unsung hero in our midst – Robert Gregory, who on the run-up to Christmas 2009 did something really remarkable while the rest of us shopped for presents – he saved someone’s life. detailed counselling session to ensure he understood the implications of his decision. 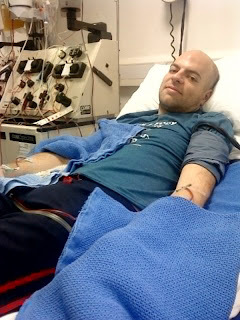 Robert felt he was fortunate in that it was decided to harvest his donation via the bloodstream rather than the more painful injections into the bone to extract stem cells. But even this process is far from plain sailing. A drug called GCSF is administered over four days prior to the donation date used which forces the stem cells into the bloodstream, following which the donor is linked via a needle in both arms to a machine for 10 hours (five hours over two days). Robert may never meet the recipient of his bone marrow as this is not allowed for five years, but the system does allow him to send an anonymous letter and also allows the recipient to respond anonymously. If the recipient requires more bone marrow in the future, Robert will be requested to undertake the procedure again – but for the moment, he’s just happy it’s all over!